Hussey, Tacitus. 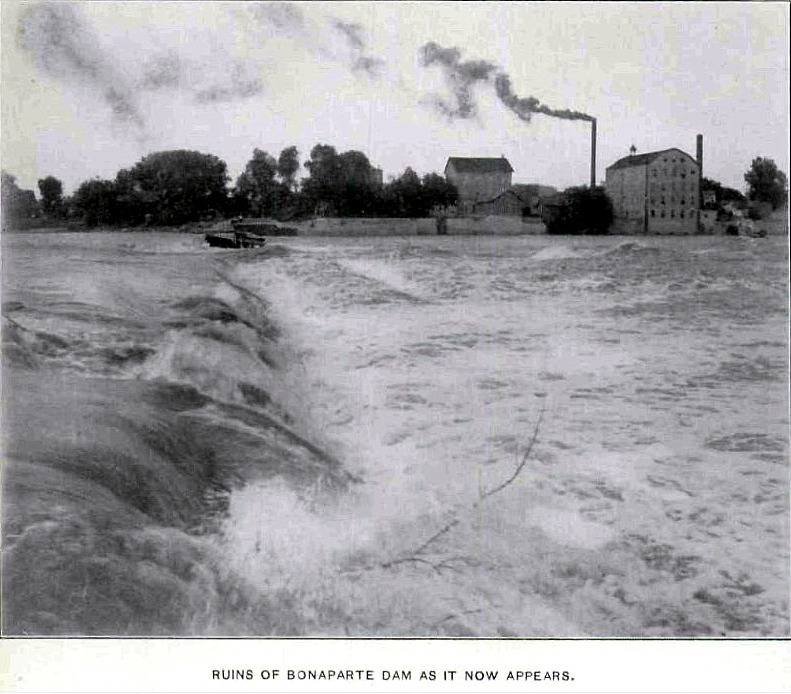 "The Story of the Bonaparte Dam." The Annals of Iowa 7 (1907), 608-618. A gentleman of prominence in the State who has been active in the preservation of her institutions and history, gave utterance to a thought not long ago which makes a very good foundation upon which to enlarge upon the theory of equal rights for the humblest as well as the proudest in our good commonwealth. The thought was something like this: 'Human food can in no way be so cheaply produced as by fish culture. Our lakes and streams should therefore be deemed, held and defended for this especial purpose, for the sole benefit of the people. Obstructions or hindrances of any sort should be strictly prohibited by law; and the law should be rigidly enforced. With the countless millions of tons of fish taken from the great oceans, lakes and streams of the world, there is no perceptible diminution of the supply, for the reason that there is no check put on their propagation, nor are there any obstructions to their going and coming to their feeding and breeding grounds. They are beyond the power of man to exterminate, as have been exterminated the buffalo on the plains, the wild beasts of the forests and the game birds of our prairies. Fish in one form or another furnishes a goodly portion of the food for the people of the world; so the thought expressed by the liberal-minded gentleman at the beginning of this paper has a wider and deeper meaning than appears on the surface. Should any untoward event deprive the inhabitants of the World of this universal food for a time, it would be a greater calamity than the destruction of any other single article of food, for the same length of time. Portions of the earth, for one cause or another, may refuse to reward the toil of the husbandman; but Old Ocean, the lakes and rivers, never! On a bright morning in the year 1888, the writer, feeling that he had a mission to perform, and wishing to make a right start, dropped into the law office of Judge George G.
"Well, you have a big job on your hands!" "Are you well acquainted with the Meek Brothers, then?" asked the writer. "Yes", replied the Judge, his eyes twinkling with good humor, "I knew the grandfather, William Meek, his son, Isaiah, and am very well acquainted with the Meek Brothers of today. William Meek, the grandfather, was a very firm man, Isaiah Meek was much firmer, bordering on obstinacy; and his sons, no doubt, have a similar rich inheritance." The richness and quality of this inheritance the fishermen of the State of Iowa learned in later years. steam, keel, and flat boats, rafts, and other water craft, provided said water craft will bear two tons burden. tached for any injury to lock or dam. The Territory reserved to itself the privilege of altering or amending the act with a view to the future navigation of the river; the right of construction and maintaining said lock and dam was to remain in force fifty years. The Meek family at that time consisted of William Meek, Sr., William Meek, Jr., Isaiah, Robert and Joseph, sons of the first named. The grist mill they established was not unlike the primitive mills for grinding corn. Occasionally, in those territorial days, one could be found inland, run by horse power, where men assembled each with a bag of corn and awaited their turns for grinding. The meal thus ground was of very coarse quality, but when mixed with water and salt, patted up by the hands of a skillful wife and baked in a skillet, especially if eggs and bacon were added to the bill of fare, made the hearts of the hungry pioneers glad. 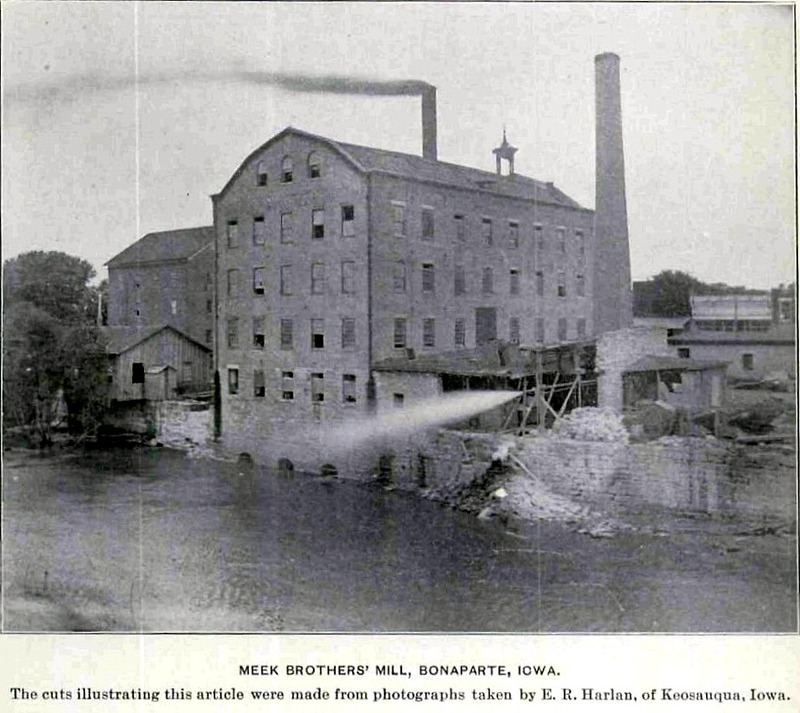 The Meeks had been millers in Michigan before coming to Iowa, so the business was well known to them, and their mill became a popular resort for the meager grists of the pioneers far and wide. The rights of a ferry had been secured by them and later a large tract of land also, which gave them control of the river front for a mile or so above the present location. keepers of the little hamlet which had sprung up about the mill profited by these prolonged visits, and quite a sum of the scanty supplies of cash was left by the waiting farmers who had come from ten to one hundred miles away to have grists ground and wool carded. Later still, the manufacture of cloth was introduced by this enterprising firm, the quality of which is not surpassed by that of any similar factory in Iowa. The mill is the pride of the village of Bonaparte, affording, as it does, work for many hands in the various departments. The large reservoir of water held back by this immense dam when at its best is as pretty a lake as there is on the Des Moines river with the exception, perhaps, of that near Ottumwa. Below the dam in the spring of the year, when the fish were vainly striving to reach headwaters to spawn, it was at one time a famous fishing place. There are men still living who have experienced the exhilarating sensations which accompany the pitching out of a wagon-load of struggling, helpless fish, in twenty-five minutes with a manure fork! A fact which is not generally known except to those who are acquainted with the dam itself, is that behind, or up-stream from the dam now in question, which is the newest and latest one built, there are two other and older dams, which, strange to say, are said to be in fairly good repair. This is to be explained by the fact that although they have stood longer they have been enlarged by the addition of floating drift and mud and have been protected, too, by the newer structure. The farthest one up stream is the old, original 'brush dam' built by the Meeks over fifty years ago. About a yard from that is the second dam which was built by the Meeks, under the direction of the government and which was fitted with gates and locks to allow the passage of boats. These locks are now closed and forgotten, and the newest dam of the three stands in front of the second. At the present time only the latest dam is visible, as the others are somewhat lower than it and are now covered with water. Just how they have stood the force of the water cannot be learned until the water recedes more; but the Meeks maintain that they are in good condition; so do other residents of Bonaparte, who claim to have investigated. Resolved, Therefore, By the House of Representatives (the Senate concurring), That our Senators and Representatives in Congress be requested to use their influence to have the said Des Moines River declared not a navigable stream, to the end that the same may be more cheaply improved as a motive power for machinery. railroad which had reached the capital of Iowa only six months before. This resolution was a libel on the Des Moines river and she resented it by "getting her back up" sufficiently high to have floated a Mississippi steamboat from the mouth of the river to the Raccoon Forks, in the years 1867, 1869, 1875, 1876, 1882, 1892, 1902 and 1903. In the same year (1866), in the effervescent excitement over the new found mode of transportation, a bill was passed disposing of the locks and draw bridges on the river, and it was understood that Representative Joel Brown, of Van Buren county, was the introducer and champion. Yet notwithstanding all this, some of our leading lawyers were of the opinion that it did not release the Meeks from the obligation to "forever maintain the locks," etc., in the Des Moines river at Bonaparte. Overtures were made to the Meek Brothers in 1894 by the fishermen and sportsmen for permission to put in a fishway, to be paid for by popular subscription. There were promises from men of prominence in various parts of the State to put up the necessary funds if a fishway were allowed; but the Meek Brothers refused the request on account of the weakening of the dam, which they alleged would be the effect. The legislature which met in 1896 was asked by many petitioners to buy the dam for the sum for which it was offered by the owners, $25,000, and which was thought to be very reasonable. This was urged by Representative G. W. Crow of Wapello county; but the effort was a failure from lack of votes, or lack of interest -- probably both. fire, January 4, 1904. There were two or three hearings before the Fish and Game Committee, at which times great pressure was brought to bear as to the feasibility of purchasing the dam; but all efforts were unavailing. Seeing the bitter disappointment of the fishermen, Senator L. C. Blanchard of Mahaska county came to their relief and drew up a bill authorizing the State of Iowa to pay the expense of a fishway in the dam and appropriating the sum of two thousand dollars for the payment of the same. This bill passed the Senate without a dissenting voice; but when it got into the House the chairman of the Fish and Game Committee lost, or pigeon-holed it, until near the close of the session. Representatives Eaton and Merriam, who had pledged themselves to its passage, hunted it up, however, and were going to call it up on the floor of the House on next to the last night of the session; but being delayed a few minutes on that evening in reaching the House, one who was probably in the employ of the Meeks, seeing his opportunity for killing the bill, had it called up by the representative of Van Buren county, and it was '\"indefinitely postponed." During the next two years, or between legislatures, a suit was brought by the State of Iowa, assisted by W. L. Read, who represented the interests of the sportsmen and fishermen, for the purpose of compelling the Meek Brothers to put a fishway in their dam; but the suit was lost on the grounds that the Meeks claimed, among other things, an "adjudication," in that some years before Fish Commissioner Griggs had brought suit against them for maintaining a nuisance, in that they had no fishway in their dam. The justice of the peace decided in favor of the defendants, and as the Fish Commissioner did not appeal the case as he should have done, but allowed it to so remain until too late, the case was considered as adjudicated and was so held by the court. An appeal was taken to the Supreme Court and the decision of the lower court was affirmed, notwithstanding some of the leading lawyers of the State declared that the "decision was badly strained." Yet law is law, and if the Supreme Judges were convinced that there had been an "adjudication," nothing more was to be said; and the fishermen, while bitterly disappointed, bided their time. Will have a good fish-way! But never gasped a word! To give us all a pass!" "You're a scaly lot of fellows!" Will be dropping us a line!" "Meeks will roar much louder than the dam!" And you're classed with Pike and Bass!" "Yes, I'm swimming in that class!" "Often stands in stead of sense!" They prepared to give "Old Bonaparte"
Could be heard for half a mile! The bill passed the Senate without a dissenting vote on March 8th. When it reached the House the "Petition" happened to strike the "funny bone" of Representative Marlin J. Sweeley of Woodbury county, who had a genius for humorous rhyming, and who wrote a reply to it, which, in turn, was responded to by the author of the "Petition," and before the fun terminated there had been written six "dam elegies,"
as they were called. The house passed the bill unanimously, on the 22d of March, upon which the Des Moines correspondent of The Chicago Tribune announced, that for the first time in the history of lowa legislation an act had been passed because of arguments in doggerel! The bill was duly signed by the Governor and became a law in the regular way. In the mean time the never-tiring elements were at work. The summer flood of 1902 evidently injured the dam to some extent. Then the heavy ice of the spring of 1903 gave it a severe battering; this was followed closely by the almost unprecedented flood of the same year, which finished what the heavy ice gorge had begun earlier in the season, riddling the fine structure with numerous holes and finally sweeping out the main part of it, leaving the two ends only in their natural positions. Surely, '"the Lord tempers the wind to the shorn lamb." Had the fishway been forced into place before the last two floods, the loss of the dam would have been attributed to that, by interested parties; and there would probably have been a suit for damages, and ''good money thrown away on both sides, besides any amount of bitter feeling engendered. quickly suppressed. The fishermen have fought the battle for the good of the people, patiently and hopefully. On the other hand, there has been a dogged determination to fight the legal battle to the bitter end, no matter what the cost. What the end of it all will be, no man has the wisdom to forecast. But of this we feel confident, that if the dam is rebuilt by the Meek Brothers, or any one else, there will go in it a fishway approved by the Governor, and the Fish and Game Warden of the State of Iowa. If such a contest was worth entering into, it is believed to be worth recording and that is why the writer, at the request of a friend, dips his pen in ink once more, and it is hoped for the last time, on this subject. He is in no wise ashamed of the prolonged part he has taken in this contest. If good has come of his efforts, well. If not, let the axiom of more than two thousand years ago be remembered: It. is expedient that one man should die for the people.